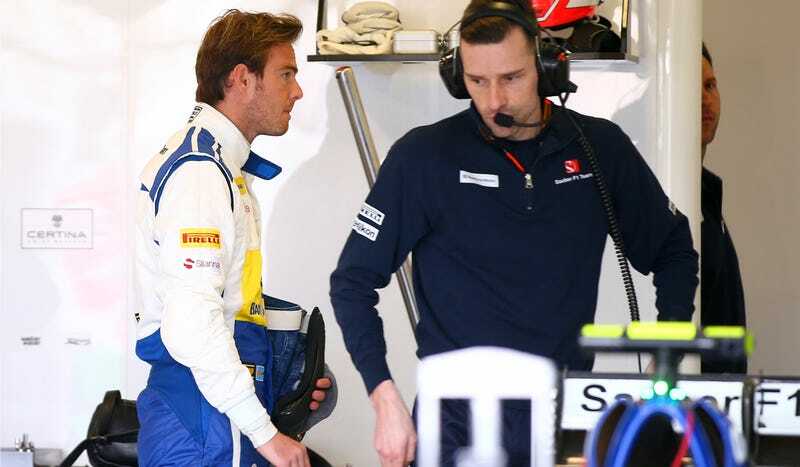 There was no decision Friday as to whether Sauber would be held in Contempt of Court for their inability to get Giedo Van der Garde into the race drive he had been promised. That court case is expected to continue tomorrow at 9:30 a.m. AEDT, on Saturday morning in Australia. Van der Garde recently won a lawsuit against Sauber over the fact that Sauber contracted more drivers for 2015 than they had seats. Courts ruled that Van der Garde was entitled to a drive with the Sauber F1 team, but that didn't happen, and Sauber appealed the court's ruling and postponed handling it until it was too late to even get Van der Garde a superlicense to drive. Penalties for the team being held in Contempt of Court are steep, with potential action including both seizure of their assets as well as either a prison term or a fine for Sauber Team Principal Monisha Kaltenborn. The biggest hang-up of them all was Van der Garde's lack of a superlicense, which got tangled up with the FIA Contracts Recognition Board. Sauber wrote the CRB to terminate their contract with Van der Garde shortly after he initiated legal action in February. However, courts ruled that this action was too late, and Van der Garde still had the right to race for Sauber in 2015. Instead of fast-tracking Van der Garde's superlicense application after the initial ruling, Sauber appealed the decision several times, with their last appeal being denied yesterday. Van der Garde's legal team filed a Contempt of Court application Thursday over the fact that Sauber had done nothing so far to allow Van der Garde to drive the car, just in case it wouldn't happen. Thursday night, according to Van der Garde's lawyer, Sauber confirmed with the CRB that they terminated their contract legally, thus blocking any attempts to fast-track Van der Garde's superlicense application. Friday morning, per F1 journalist Adam Cooper's live-tweets, a hearing took place for any possible Contempt of Court action. Van der Garde's lawyer hammered on the fact that Sauber would not tell the CRB that their contract with Van der Garde is actually still valid. In response, Sauber's lawyer brought up that Monisha Kaltenborn wrote the FIA yesterday asking if it would be possible to grant a superlicense for Van der Garde this weekend. While asking if a superlicense can be granted may give the appearance to some that Sauber is tried to comply with the court order, Sauber's reminder to the CRB that they had terminated their contract with Van der Garde effectively blocked any attempts to fast-track a superlicense for the embattled racer. Likewise, the morning's seat fitting was a bit of legal theater as well. With no superlicense, there was no way Van der Garde could drive, and he looked comically out of place wearing a driving suit tailored for Marcus Ericsson, who is a tad shorter. Meanwhile, the FIA maintained that they are not a party in the dispute. The FIA told Van der Garde that this dispute was between him and Sauber directly. The judge hearing the case had another matter to attend to, and thus, took a break until 3:15 p.m. AEDT. That break was extended to about 4:30 p.m. AEDT at the request of both parties, when the proceedings restarted. As the case continued, Sauber sent both of their cars out in Free Practice 2 with their only superlicensed drivers at the moment: Nasr and Ericsson. Both Sauber cars had sat in the garage for all of Free Practice 1. According to Adam Cooper, who was once again live-tweeting from the courtroom, Van der Garde's lawyer started off by citing precedent for their proposed Contempt of Court action from an Australian Meat Employees Union case. Sauber's turn was next, and their lawyer requested more time to be able to speak with Team Manager Beat Zehnder, who was at the track attending to the cars running Free Practice 2. In response, the judge discussed an interim order, where the ruling would be postponed to next week. Unfortunately, this would mean that every one of Sauber's assets in Australia would have to remain there for the week, and the team's cargo would miss the official Formula One Management-run flight to the next race. Should Sauber's assets not be seized by the courts, they would have to figure out their own way to transport everything to Malaysia for the next race at great additional expense. Meanwhile, as the court was in recess, the number 9 Sauber being driven by Marcus Ericsson broke a rear suspension piece, sending it back into the pits. Fortunately for Sauber, the judge opted to restart the case at 9:30 a.m. AEDT Saturday instead. There was one significant bright spot of the latest proceedings, however: it seems as though Sauber and Van der Garde's sides are talking more with each other. There is some hope of this issue being settled without the need for bailiffs to seize anything from the team (or worse). Van der Garde's lawyer told the courts that there had been "constructive discussions between the parties which are expected to continue this evening," as quoted in Adam Cooper's F1 Blog. Cooper reported that both sides of the case would like to see the Sauber cars race this weekend. The Supreme Court of Victoria Twitter account confirms that the "Judge has urged parties to have very sensible discussions." Meanwhile, things back at the track seem to be as normal as they can be, regardless. Bailiffs that were on standby should the team be held in Contempt of Court dispersed from the circuit once the court adjourned for the day. Monisha Kaltenborn even made it to a team principals' press conference, in which she reiterated that she could not comment on current legal action. According to Autosport, Kaltenborn admits that the uncertainty surrounding all of this legal wrangling has had a negative effect on the team, although she would not comment on any matters directly related to the case itself. We'll find out how close to agreement both sides are in this case tomorrow, as well as who will end up driving the Sauber race cars for the weekend.